While Danish Romantic violin concertos aren't exactly ten a penny, these three important examples of the genre firmly establish that the great Romantic violin concerto certainly had a place in Danish music: from Niels W. Gade's grand, finely orchestrated concerto from 1880 through P.E. Lange-Müller's concerto from 1902 with its many moving melodies to 1943-44 when Rued Langgaard combined old virtues with new currents in his brief pastiche of a violin concerto. These three rarely-performed works are presented on this release by one of Denmark's absolutely finest soloists, Christina Åstrand, here in good Finnish company with the Tampere Philharmonic and its chief conductor John Storgårds. 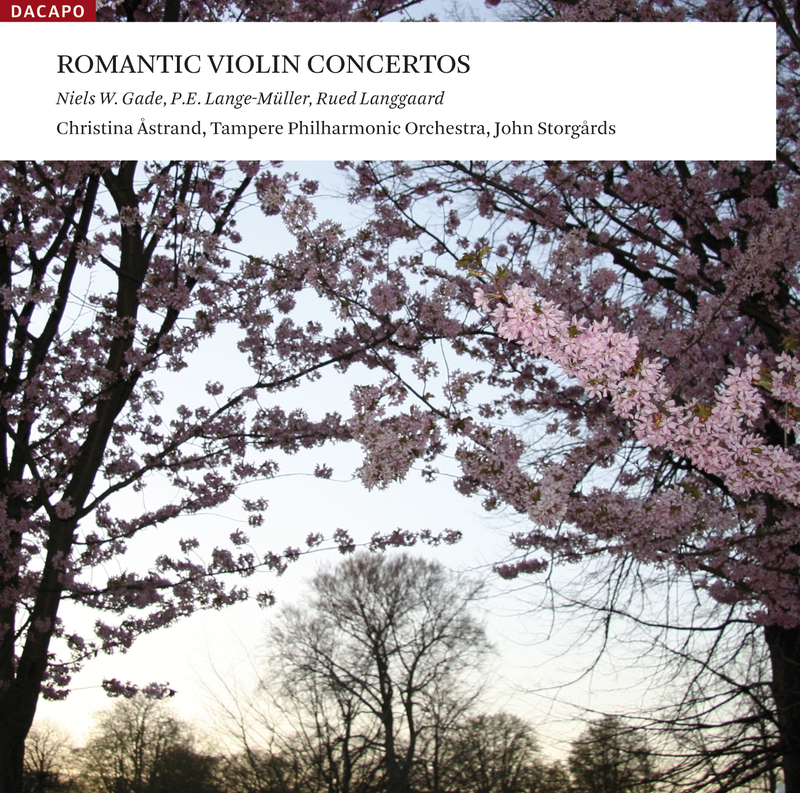 "All three concertos are beautifully executed by Christina Åstrand who shows off the upper register of her instrument with a lovely purity of both tone and intonation." I Allegro con fuoco 11:31 12,80 kr. II Romanze - Andantino espressivo 7:25 9,60 kr. III Rondo scherzando - Allegro, ma non troppo 8:02 9,60 kr. I Moderato 9:19 9,60 kr. II Allegretto sostenuto 5:15 9,60 kr. III Allegro gioioso 10:22 12,80 kr. Allegro vivace - Mosso - Tempo primo - Cadenza espressiva - Animato - Finale: Scherzoso - Più mosso - Scherzoso - Più animato - Molto allegro 9:33 9,60 kr. Niels W. Gade's violin concerto is a true Romantic concerto with the permanent focus on the soloist. Gade stays within the traditional formal sequence, and in the texture of the movements he proves himself a true symphonist with great attention to the develop-mental and thereby the dynamic aspects. As can also be noted in several other late orches-tral works, over the years Gade developed well nigh supreme mastery of the instru-mentation, which along with the fine treatment of the themes gives the work an immediate appeal. It is as true of the violin concerto as of a whole series of concertos and symphonies by other composers that the apparent weaknesses are often to be found in the final movement. Comparing it with the great violin concertos of the period, we must indeed concede that the final movement of Gade's concerto lacks Men-dels-sohn's ethereal butterfly lightness or Brahms' gravity and rhythmic dynamism. But perhaps we should assess the concerto more as a whole on its own terms in this difficult genre. As such it has cohesion and expressive qualities that should grant it a more pro-mi-nent position in the concert repertoire than has hitherto been the case. That Gade wrote a violin concerto can come as no surprise in itself: as mentioned above, it was a tradition in Romanticism to compose weighty violin concertos - we need only think of Mendelssohn's, Schumann's, Brahms', Bruch's, Tchaikovsky's etc., and Gade had great experience: as an orchestral composer he could look back on a series of successes. It is far more striking that P.E. Lange-Müller, at the height of his career, took on the concerto genre. Ever since his early first opus, the songs based on extracts from B.S. Ingemann's cycle of poems -Sulamith og Salomon (Solomon and the -Shula-mite), Lange-Müller had shown himself to be a born vocal composer. Although he wrote several collections of fine, sure-handed piano pieces, the ‘romances' and the music for the stage are the most important things Lange-Müller wrote. Of course this did not prevent him from trying his hand with the major instrumental genres - the piano trio from 1898 is for example one of the finest Danish chamber works of Late Roman-ticism - but his two symphonies, no. 1, Autumn (performed in 1882), and no. 2 (com-posed in 1889 and revised in 1915), have lived rather in the shadows and have only seen a few performances. It is first and foremost the absence of symphonic development that has barred the path of these works into the concert hall. But the lack of success in this area did not discourage Lange-Müller, and on 18th April 1904 at Dansk Koncert-Forening he could present his new violin concerto in C major. On this occasion the composer himself wielded the baton, and as the soloist one could hear Axel Gade, Niels W. Gade's son, who like Anton Svendsen was a musician in the Royal Orchestra and a pupil of Joseph Joachim. Lange-Müller's violin concerto was composed in 1902, and in connection with the work on it the composer consulted Axel Gade, who wrote a cadenza for the first performance of the concerto. The work opens with the grandly conceived first subject with its basic material expressed in the first four bars and repeated, sequenced and varied in what follows. The solo violin ‘falls in' in b. 8, where it takes over the melody line like an extra orchestral instrument. In the 60 bars covered by the first subject a culmination appears in b. 45. By this time the harmony has moved into B major, the dominant of the second subject's E minor. The 58-bar second subject section is dominated by the supple springdans-like theme. Accompanied by the long trills of the solo violin the movement enters the development section, which is introduced by a series of solo entries in the orchestra. A slightly stylized dance version of the first subject enters in the orchestra, while the soloist keeps up the second subject, but gradually the first subject makes itself more strongly felt up to the abbreviated recapitulation. The movement is furnished with an alternative ending (\\ad libitum\\), where, as mentioned before, there is a space to interpolate a cadenza. This brief account of the movement shows how schematically Lange-Müller has treated the sonata form. The bearing elements in the movement are more the subjects and the melodic elaboration than the structural development. The second movement bears the marks of Grieg, not least in the short intermezzi in the orchestra. That is not surprising, for at the end of the nineteenth century inspira-tion from Norwegian music was very strong - it can be heard in Lange-Müller's younger colleagues Louis Glass and in Carl Nielsen. The final movement is energetic with several harmonically striking passages and - like the first movement - long melodic lines. There are some indications that for many of the early years it was customary to insert a solo cadenza in the violin concerto, for in The Royal Library, besides Axel Gade's, there are another two cadenzas by Tor Aulin and Julius Ruthström. On this CD the work is played without a cadenza. Like his two predecessors Gade and Lange-Müller, Rued Langgaard composed only one violin concerto, and like their concertos, Langgaard's too has led a quiet life. The work was begun in July 1943 and was finished on 3rd February 1944. It was not played during the composer's lifetime, but had to wait until as late as 1968 for its first per-for-mance on Danmarks Radio in a studio production with Kai Laursen as soloist and the Odense Municipal Orchestra conducted by Aksel Wellejus. This performance has later been incorporated in the Danacord label's CD box of 26 Danish violin concertos played by Laursen. Although the work bears the title Concerto (in one movement), it hardly meets most listeners' expectations of a violin concerto. For one thing the work is very short - it lasts just under ten minutes - for another the violin is not at the absolute centre of the concerto, since it is accompanied by a concertante piano which like the violin forms part of the almost chamber-music-like structure. The concerto has a decidedly pastiche-like character where High Romantic elements are mixed with newer stylistic features. The three concertos show how the great Romantic violin concerto also found a (late) expression in Danish music. Gade's concerto was written for the great contempo-rary violinist Joseph Joachim, and as such can indeed be placed in the great central European concert tradition. Lange-Müller's can be regarded as a further development of this concerto type, such that it can be fitted into the universe of the romanze composer. Rued Langgaard's little concerto is a personal, perhaps wistful look back at a bygone tradition. Gades Violinkonzert ist ein echtes romantisches Konzert, bei dem der Solist ständig im Mittelpunkt steht. Der Komponist hält sich an den herkömmlichen Formablauf und erweist sich in der Satzarbeit als echter Sinfoniker, der dem Entwicklungsaspekt und damit der Dynamik des Verlaufs große Aufmerksamkeit widmet. Wie auch in mehreren anderen späten Orchesterwerken festzustellen ist, entwickelte Gade im Laufe der Jahre eine nahezu souveräne Beherrschung der Instrumentation, die dem Werk zusammen mit der schönen motivischen Arbeit unmittelbar einsichtige Qualitäten verleiht. Für sein Violinkonzert wie für eine lange Reihe von Konzerten und Sinfonien anderer Komponisten gilt, dass die unmittelbaren Schwächen oft im Finale zu suchen sind. Vergleicht man die großen Violinkonzerte der Zeit, muss man denn auch zugeben, dass Gades Konzert weder die überirdische, schmetterlingshafte Mendelssohnsche Leichtigkeit noch die Schwere und den rhythmischen Schwung eines Brahms besitzt. Vielleicht aber sollte man das Konzert insgesamt eher von seinen eigenen Voraussetzungen in dieser schwierigen Gattung her beurteilen. So gesehen hat es nämlich eine Zusammenhangskraft und Ausdrucksqualitäten, die ihm eine bessere Platzierung im Konzertrepertoire verschaffen könnten, als dies bisher der Fall gewesen ist. Es ist nicht weiter verwunderlich, dass Gade ein Violinkonzert schrieb. Wie gesagt waren in der Romantik gewichtige Violinkonzerte Tradition, man braucht dabei nur an Mendelssohn, Schumann, Brahms, Bruch, Tschaikowsky u. a. zu denken, und Gade besaß große Erfahrung und konnte als Orchesterkomponist auf zahlreiche Erfolge zurückblicken. Weit auffälliger ist es, dass sich P.E. Lange-Müller auf der Höhe seiner Karriere an die Konzertgattung wagte. Bereits in seinem ersten Frühwerk, den Liedern zu Auszügen aus B.S. Ingemanns Gedicht-zyklus Sulamith og Salomon, hatte sich Lange-Müller als der geborene Vokalkomponist erwiesen. Er schrieb zwar auch mehrere Sammlungen schöner und sicher gestalteter Klavierstücke, die Romanzen und seine Musik zu den Bühnenwerken verbleiben jedoch seine bedeutendsten Kompositionen. Das hinderte ihn selbstverständlich nicht daran, sich auch in den größeren Instrumentalgattungen zu versuchen. Sein Klaviertrio von 1898 gehört beispielsweise zu den besten dänischen Kammermusikwerken der Spätromantik. Doch seine beiden Sinfonien, die 1882 aufgeführte Nr. 1 Efteraar (Herbst) sowie die 1889 komponierte und 1915 überarbeitete Nr. 2, mussten ein Schattendasein fristen und wurden nur wenige Male aufgeführt. Es war in erster Linie die fehlende sinfonische Entwicklung, die diesen Werken den Weg in den Konzertsaal versperrte. Lange-Müller ließ sich durch seine Erfolglosigkeit in diesem Bereich jedoch nicht entmutigen. Am 18. April 1904 konnte er im Dänischen Konzertverein sein neues Violinkonzert in C-Dur vorstellen. Der Komponist führte bei dieser Gelegenheit selbst den Taktstock, als Solisten hörte man Axel Gade, den Sohn von Niels W. Gade, der so wie Anton Svendsen Königlicher Kapellmusikus und Schüler von Joseph Joachim war. Lange-Müllers Violinkonzert wurde 1902 komponiert. Während der Arbeit beriet sich der Komponist mit Axel Gade, der im Übrigen für die Uraufführung zu dem Konzert eine Kadenz geschrieben hatte. Das Werk beginnt mit einem breit angelegten Hauptthema, dessen Grundstoff bereits in den ersten vier Takten enthalten ist, die im Folgenden wiederholt, sequenziert und variiert werden. Die Sologeige „fällt\\ in Takt 8 „ein\\, wo sie wie ein richtiges Orchesterinstrument die Melodieführung übernimmt. In den 60 Takten des Hauptthemateils kommt es in Takt 45 zu einer Kulmination. Die Harmonik hat sich hier zu H-Dur hinbewegt, der Dominanten zum e-Moll des Nebenthemateils. Der 58 Takte lange Nebenthemateil ist getragen von dem geschmeidigen, springtanzähnlichen Thema. Begleitet von dem langen Triller der Sologeige geht der Verlauf in den Durchführungsteil über, der im Orchester mit einer Reihe von Soloeinsätzen eingeleitet wird. Im Orchester setzt eine leicht stilisierte Tanzfassung des Haupthemas ein, während der Solist am Nebenthema festhält. Doch allmählich setzt sich bis hin zur verkürzten Reprise das Hauptthema stärker durch. Der Satz ist mit einem alternativen Schluss („ad libitum\\) versehen, der wie erwähnt die Möglichkeit einer Kadenz bietet. Diese kurze Erläuterung des Satzes zeigt, wie schematisch Lange-Müller mit der Sonatensatzform umging. Satztragend sind eher die Themen und die melodische Bearbeitung als das Strukturelle des Verlaufs. Der zweite Satz zeigt Grieganklänge, was nicht zuletzt für die kurzen Orchesterzwischenspiele gilt. Das ist nicht weiter verwunderlich, denn gegen Ende des 19. Jahrhunderts holte man sich sehr viele Anregungen aus der norwegischen Musik, was auch bei Lange-Müllers jüngeren Kollegen Louis Glass und Carl Nielsen zu hören ist. Das Finale ist ein energischer Satz mit mehreren harmonisch frappierenden Passagen und, ähnlich wie im ersten Satz, langen melodischen Linien. Einiges spricht dafür, dass es zunächst viele Jahre lang üblich war, in das Violinkonzert eine Solokadenz einzubauen; denn in der Königlichen Bibliothek von Kopenhagen liegen außer Axel Gades noch zwei weitere Kadenzen, nämlich von Tor Aulin und Julius Ruthström. Auf der vorliegenden CD wird das Werk ohne Kadenz gespielt. Rued Langgaard komponierte so wie seine beiden Vorgänger Gade und Lange-Müller auch nur ein Violinkonzert, das ebenso wie die Konzerte dieser beiden ein stilles Dasein geführt hat. Das Werk wurde im Juli 1943 begonnen und lag am 3. Februar 1944 fertig vor. Es wurde zu Lebzeiten des Komponisten nicht gespielt, sondern musste bis 1968 auf seine Uraufführung warten. Der Dänische Rundfunk brachte es in einer Studioaufnahme mit dem Solisten Kai Laursen und dem Odenser Stadtorchester unter der Leitung von Aksel Wellejus. Diese Aufführung wurde später in die von der Plattengesellschaft Dana-cord herausgegebene CD-Box mit 26 von Laursen gespielten dänischen Violinkonzerten aufgenommen. Das Werk trägt zwar den Titel Konzert (in einem Satz), entspricht aber wohl kaum dem, was die meisten Zuhörer von einem Violinkonzert erwarten. Zum einen ist das Werk ziemlich kurz, es dauert nämlich nur knapp zehn Minuten, zum anderen ist die Geige nicht der absolute Mittelpunkt des Konzerts, da auch noch ein konzertierendes Klavier mitwirkt, das wie die Geige in die fast kammermusikalische Struktur eingeht. Das Konzert hat ausgesprochenen Pasticciocharakter, bei dem sich hochromantische Elemente mit neueren Stilzügen mischen. Die drei Konzerte zeigen, dass das große romantische Violinkonzert, wenngleich erst spät, auch in der dänischen Musik seinen Ausdruck fand. Gades Konzert wurde für den großen zeitgenössischen Geiger Joseph Joachim geschrieben und lässt sich als solches auch in die große mitteleuropäische Konzerttradition einreihen. Lange-Müllers Werk ist als Weiterentwicklung dieses Konzerttypus zu betrachten und passt in die Welt des Romanzenkomponisten. Rued Langgaards kleines Konzert ist dagegen ein persönlicher, vielleicht auch wehmütiger Rückblick auf eine dahingegangene Tradition.